← What’s cooking, Uncle Sam? Who, flying into Canberra in 1930 for lunch, was so important that the sheep were specially cleared from the Duntroon aerodrome field? The wonderful Amy Johnson, that’s who! In 1930, Amy Johnson captured the hearts and imagination of Australians when she became the first woman to fly solo from Britain to Australia. She didn’t quite succeed in breaking the record Bert Hinkler had set two years before of 15.5 days. However, flying a tiny Gypsy Moth because that’s all she could afford, 26 year old Amy set an enormously respectable time of 19.5 days, landing in Darwin on 24 May 1930. For this, she won a prize of 10,000 pounds that had been offered by English paper The Daily Mail for the first woman to fly solo from Britain to Australia (it’s probably fair to guess that they thought their money was safe when they offered the prize). Amy’s feat was an immediate cause for celebration all around the nation. Some Australians tried their luck at using this mood to make money. William Robert Gray and Mary Bruce (both, coincidentally, from South Australia) decided to write poems – Gray’s poem was a particularly epic effort, entitled ‘Amy Johnson (Lady Amy of Boadicea)’, while Bruce went for a clever little acrostic poem. Composer and song writer Billy Maloney wrote and copyrighted ‘Take your hats off to Amy Johnson: that wonderful flying girl’. Other Australians just wanted to meet this dynamic young woman. One such person was Prime Minister James Scullin. How could she tour the country without dropping into the national capital and having an official reception and lunch with him? 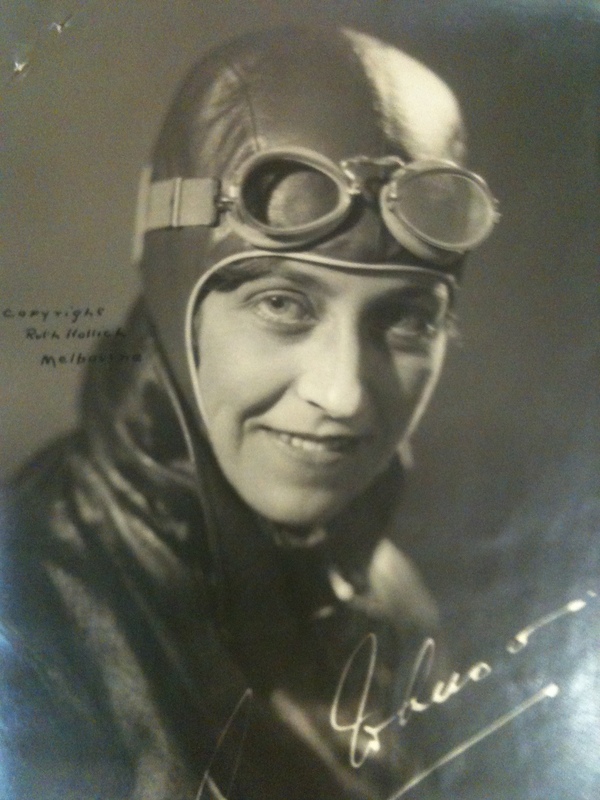 So although Canberra had not originally been on her schedule, Amy Johnson dropped in for half a day on 14 June 1930. The organisational effort was considerable. Even with her short stay of only hours, local societies still wanted her to attend special dances in her honour – their suggestions had to be politely rejected. A flying reception committee was sent to meet her – early on it was suggested that all the pilots in the reception planes should be women – but this was scrapped when it proved difficult to find enough female pilots. There certainly weren’t enough pilots in Canberra – the reception committee flew in from Sydney, with the government promising to pay for their fuel. The sheep were cleared from the aerodrome field, and the Opposition asked questions in Parliament about whether the powerline at the end of the runway had been removed. Amy Johnson had crashed her plane irreparably on her arrival in Brisbane’s Eagle Farm, so she didn’t fly in under her own steam. Undaunted, she still flew in – but as a passenger in someone else’s plane. The food on offer seems disappointingly prosaic, especially as this was a lunch to honour such a remarkable woman. It does raise questions for me... Where did the Parliament House kitchen get its whiting from - and how fresh would it have been? 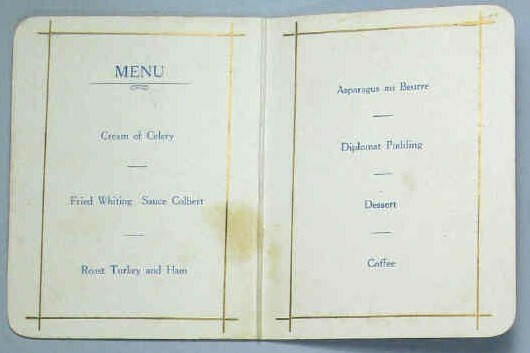 Does anyone have any clues about what a diplomat pudding might be? And is that a food stain on the menu? However, don’t despair -someone also invented an Amy Johnson cake! This one’s not from the National Archives, but it’s worth including anyway. Rub 2ozs butter into 1 large cup S.R flour, sifted with a pinch of salt, mix to firm dough with a little milk. Roll out 1/4″ thick and line a greased cake tin. Spread with raspberry jam and sprinkle with 1/2 cup currents. Then make a sponge mixture: beat 2 eggs and 3/4 cup of sugar until light and fluffy. Fold in 1 cup sifted S.R flour and finally 2 tablespoons butter melted in 3 tablespoons of milk. Pour on top of pastry. Bake about 40 minutes in moderate oven. When cold, ice with thin lemon icing and sprinkle with coconut. 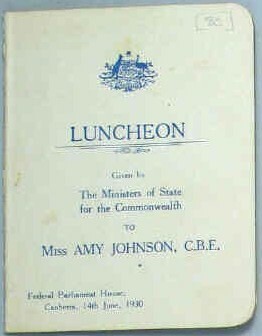 But did Amy Johnson enjoy her stodgy lunch in Canberra? Hard to say. She did send a note thanking the Prime Minister for the occasion, noting that it was a pity the weather was so ordinary. June in Canberra can be a bit awful. But it certainly showed that as well as being a very adventurous and capable pilot, she was a polite young lady! This entry was posted in 1930, ACT, copyight collection, menu, National Archives, recipe and tagged Amy Johnson, Country Womens Association, food, Prime Minister Scullin, solo flight, sponge cake. Bookmark the permalink.